Newfoundland Styro’s EPS roof insulation is reliable, cost-effective and compatible with major roofing materials and systems. Newfoundland Styro has been producing quality EPS roof insulation for decades. Expanded Polystyrene (EPS) stands the test of time and EPS roof insulation is a proven performer in roofing applications. Field studies of EPS roof installations that are 20 to 25 years old and older show that EPS roofing insulation performs well in roof applications. 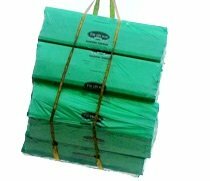 EPS roof insulation has no thermal drift and does not use blowing agents that diffuse out of the insulation. EPS roof insulation R-values remain stable over their entire life without loss of R-value. Newfoundland Styro EPS roof insulations are engineered to give you the greatest possible control for your roofing system application. From design and timelines, to materials and costs, Newfoundland Styro products have virtually unlimited design flexibility and can be easily customized. This gives our products the ability to be used for any industrial structure in a wide variety of applications and excellent for flat roof home remodel. Newfoundland Styro Tapered Roof Insulation was developed more than 30 years ago with a dual purpose: to drain and insulate dead-level roof decks. Lightweight Newfoundland Styro EPS is a value-engineered system that has been proven in new and re-roof applications. The roofing industry accepts that membrane performance and roof drainage go hand-in-hand. Membrane manufacturers will not guarantee the performance of their system without positive drainage and building codes mandate this. Simply stated, all single-ply, modified bitumen and BUR roofing membranes are less likely to leak and fail if water is not standing on top of them. Potential water damage to the building and its contents is thus eliminated. Tapered EPS provides the drainage and insulation necessary under all commercial roofing systems. It has been used successfully in millions of square feet of single-ply, modified bitumen and built-up roofing. Newfoundland Styro Tapered Roof Insulation is a great solution for low-slope roofing. Pre-engineered, factory cut, cricket systems provide effective and economical drainage on structurally sloped roof decks. Newfoundland Styro Flat Roof Insulation provides the high, long-term R-value of EPS. Suitable for use with all roofing membrane materials, EPS roof insulation is compatible with loose-laid and attached single-ply membranes, conventional built-up roofing or modified bitumen systems. Newfoundland Styro Flat Roof Insulation is unfaced EPS and is suitable for use with loosely laid single-ply membranes. It is also used with conventional BUR and mechanically or adhesively attached single-ply and modified bitumen membranes when field-applied coverboards are use. Boards are standard 4' x 4' and 4' x 8' sizes.